Sign-Age goes beyond the ordinary to provide you with the resources, expertise and design flexibility to meet your signage needs. 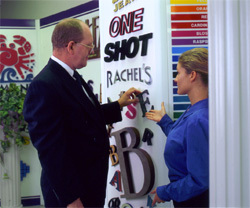 Sign-Age is a leader in custom fabricated promotional, informational and architectural signage. Planning plays a large part in our success. We take the time to understand your needs and desires. Our experienced team is available to serve and assist you with practical suggestions and simple answers to even the most complex signage questions. To learn more about the many products we offer, please contact one of our visual communication representatives.